@keszegh if you pm me with a zip of the textures I'll try make a pack here and see if I have the same issue (with those specific textures)? thanks for the offer, i will send you something whenever i get the time. 2017.8.2 published, fixing more bugs reported here. 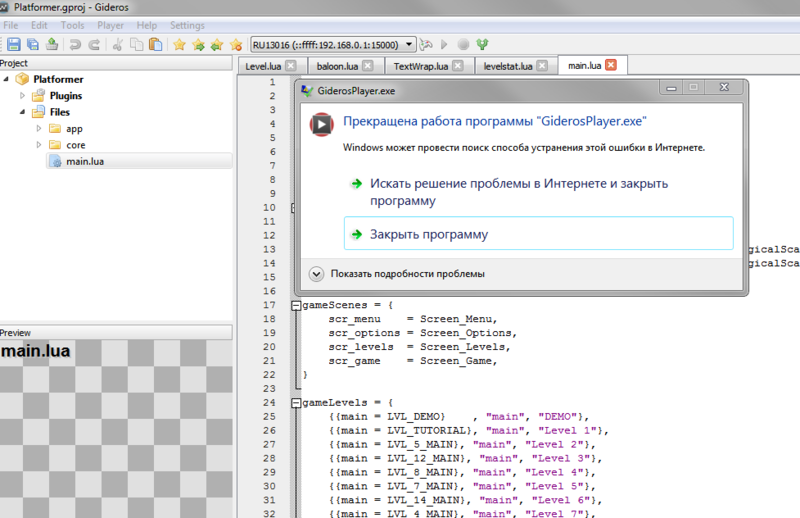 The VS project file exported from Gideros seems to be lacking any reference to the Plugins folder. The app I'm trying to build for the Windows Store quits when it fails to load the lfs library. Am I missing something, or is this an issue in the latest Gideros version? Hi @PaulH, last I tried it was ok (2017.8.1) and nothing changed in 2017.8.2 for WinRT. I'll try anyway but did you actually add the plugin you need in your project tree ? Maybe I'm missing something really basic. I've looked around for any place to specify what plugins to include. How and where do I add the plugin? The only plugin I need for the build in question in LFS. I see that the Plugins folder is included in the giderosgame.Shared folder in the WinRT solution, but evidently not linking. Yep, I was missing something that should have been obvious - the Plugins folder that was added since I last updated Gideros. I've added Lua File System in that folder. Testing now... Bingo... Seems to be working again. Thank you! It's a lot better now though that the plugins are right there in the project. Yes, that's a fantastic improvement! Yeah, the latest Gideros is amazing. Nice, just moved and got back upto date with everything, Will donate again very soon! thanks for v. 2017.8.3, it fixes some important things. Gideros over 2017.8, sometimes Player.exe crashes after I stop running program on Windows. Any clues ? Does 2017.9 also do this? Yep, I took screenshot from last version. It does not falls accidently, but after I click close button. Disturbs not much, but still. Bug found on two different Win 7 x64 and Win 10 x64 machines.